While helping someone else to use OpenScale I decided to build a quick prototype of a small weight scale. I create a brief article on it (including code) on the following link for anyone that finds it useful. Can someone help me? 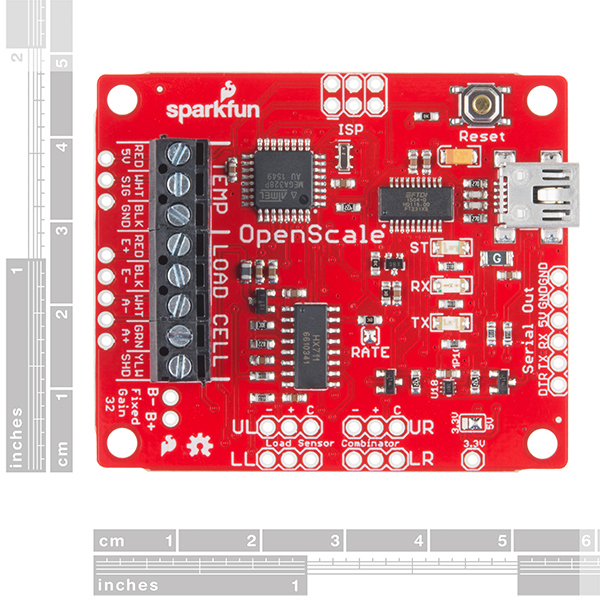 I want the scale data to display on a 16 x 2 LCD Display using the Sparkfun SerLCD board using the Serial Out ports on the OpenScale board. I've connected the TX on the OpenScale to the RX on the SerLCD. I've tried the basic "Hello World" sketch using the SoftwareSerial library. I don't know what the pin out is. I tried a few combinations, based on what I thought the the ATmega schematic said, but no luck. I'm connecting via USB to power the board. I thought that might be an issue, but connecting from a battery pack with a USB connector didn't work either. I have my own custom sketch for the OpenScale, which works fine over USB serial. I just want that data to display on the LCD. Can anyone help me to solve this problem. I want to round three decimals with the number assigned by a graduator 2 gr ,5 gr, 10 gr, 50 gr ,100 gr. For example, if we have currentReading 1.251 kg and we want the accuracy of 5 gr the total weight must be displayed 1.250 and if we have currentReading 1.253 kg weight must be displayed 1.255 and so on.. Thanks in advance! This is not formatted nor complete but should get you on the right track. You'll also have to figure out how to set the number of decimal places along the way. roundedWeight = x + (5-y) // when rounding up the modulous needs to be subtracted from 5 then added to the original weight. //for example, if weight was 1.254, x= 1254, y = 4, roundedWeight = 1254+(5-4) = 1255.
roundedWeight = roundedWeight/1000 // again, need to figure out the deicmals. The other functions will follow a similar pattern based on the assigned graduator. If you have any more questions let me know and hope this helps. Thank you for your quick reply and for solution ! I found a solution but your solution is the right. "setting_division_value" is saved in the memory by the user. Sweet! Thanks for sharing your solution as well. For the kitchen scale, is there any amazon link you can share that is easy to tear open and use? The user guide doesnt provide any particular kitchen scale compatible with the the 10kG load cell. Here's the kitchen scale I used. Has anyone tried to re-use the Temp signal as a GPIO? Theoretically you should be able to, but I was just curious if anyone has? My OpenScale SEN-13261 has been reading undisturbed since about 5:20 pm yesterday with a 100 lb load; however, I'm occasionally getting outlier readings (+/- ~2700 lbs). Refer to the plots below; Is this noise from the HX711 ADC, or a firmware bug? Plotted values are the max/avg/min of the last 50 readings from OpenScale serial port. Any ideas on what to do about the outliers? Is anyone else seeing this same issue? At 5v input required, how does one get this to run outside on a single 3.7v cell with Sunny Buddy? Seems strange that this was (as I understand it) initially designed to measure a beehive weight in an outdoor project, but then relies on 5v and has no wifi/ESP8266 option or terminal. when i try to power this using 5v it works but does not start to send data on power, it just idles unless i connect via usb to the ftdi chip. how do i make it start sending readings without connecting it to a usb port? Hello, Is possible to connect it to arduino? i'm using a xbee on arduino to send some data. Yes, I was able to do this. I used an arduino uno and I connected the Serial out of the Openscale to the arduino. So GND <-> GND, and the TX of Openscale to RX of Arduino. For your code, just do the regular Serial setup for 9600 baud, and do Serial reads for the data. Can you interface wit this on i2c or SPI? I'm imagining setting up a screen for weight readout, but perhaps I should go with my own arduino and the HX711 load cell amplifier if I want to create a standalone device? Is there a way to read the OpenScale in Labview? I just downloaded makerhub and have been experimenting with Arduino connected into LabView. I'm playing with an example which needs more resolution then a standard Arduino, can I plug my OpenScale into the program and record a potentiometer output using it? The Atmega328 on Openscale is there to handle communication. There is no I/O broken out for something like blinking an LED or reading potentiometer output. However, I think you might be able to record and process data from the load cells in Labview. Labview does give you access to I2C and SPI functionality on the MCU-the SPI pins are accessible on OpenScale through the AVR programming header and SDA and SCL can be accessed from the drains of Q1 and Q2 - This will give you the Temp data. I haven't used OpenScale with Labview but I might try now. I don't see how it could be a greater benefit to use Labview in this case but I don't see why it wouldn't be possible. If resolution is what you are looking for though the Atmel MCU used on OpenScale is the same as the chip used on an Arduino so the resolution should be the same. opening the Eagle files available for OpenScale I see that probably they are related to a previous revision of the schematic/pcb because the combinor for individual load sensors is not present. Is there any chance to have the Eagle files updated to the current release of the PCB? Hi, Thanks for bringing this to our attention. It has been updated. In the latest firmware the loadcell tare value is not taken from EEPROM, its hardcoded to 8647409. is it a bug? 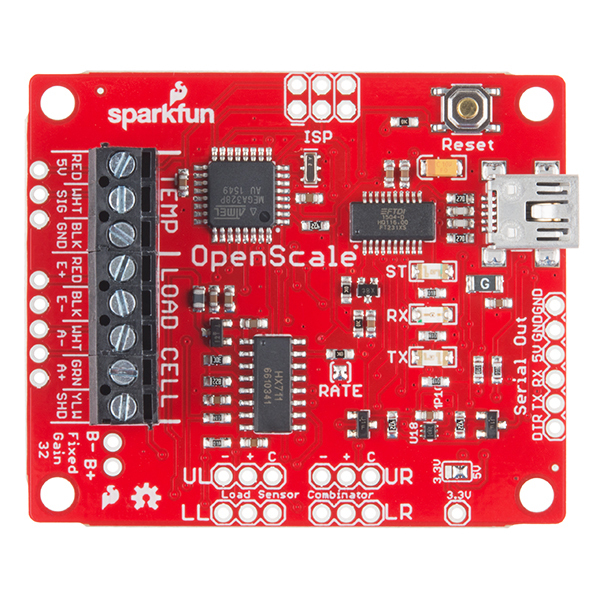 What is the meaning of "A load cell with OpenScale can remain in place for months without needing user interaction", does it mean OpenScale needs calibration after using it for some months? I have a bathroom scale with four load sensors, each sensor has four wires (not three). How do you suggest I connect it to the Openscale please? I can't see any reference to four wire sensors in the hookup guide. Thank you. "No Remote Sensor Found" refers to an external temp sensor that is connected to the screw terminals on the board. I've never used that load cell before and I couldn't help much with mounting it. I'm sure you can some documentation on mounting the load cell. Have you been in the calibration menu yet? I found : the colors from the cell are not the same as the openscale ! It seems it works ! Thank for the reply ! The link to the hookup guide is MIA. Question: The ability to capture data, coupled with sending that data, via blue - tooth module, or wifi, with a potential AWS backend? I have used two of these devices in a 3D printed motor test rig (measure thrust and torque) for my quadcopter motors. Two load cells where integrated in the support beams. The UART interface with simple ascii commands for tare and measure was a no brainer, automating data collection along with current, voltage and RPM (the latter using some other IR photodiode from Sparkfun). First order low pass filtering can be added and no noise will be seen. Accuracy was as with any kitchen digital scale, or at least I did not notice any difference when calibrated against them. I would only miss advice in the supporting material whether expanding the cabling lenght from the load cells to this device has any bearing on accuracy, since I needed to separate the propeller side from the measurement devices for safety. Regards. Works well once you fix one bug in the firmware. It was resetting the zero value every time I power cycled the board. I had to comment out this line in the code "setting_tare_point = (long)696293;" so it did not reset the zero/tare every time the board is power cycles. 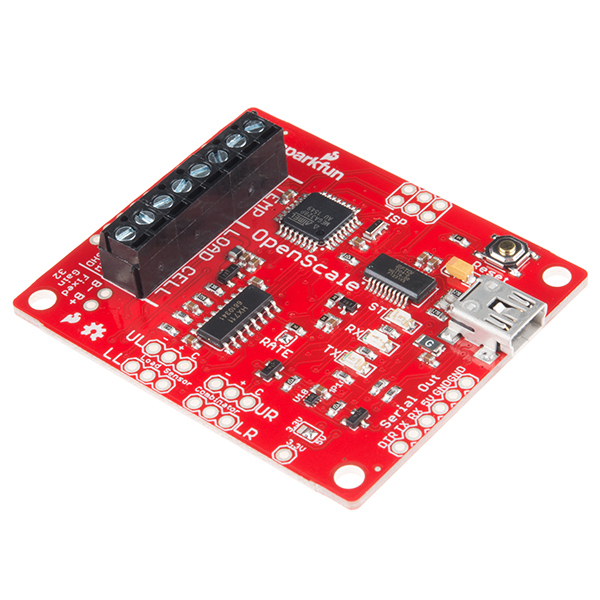 To upload new code to the board you have to use an older version of the arduino software. The most recent version would not upload software to this board but arduino version 1.6.5 worked fine. I do industrial automation for a living and work with most of the scales/indicators. For the price, this is a great little device. Also, the integrated AVR is wonderful. Very accurate even with no hardware filtering. Actually, you can help! Since all of our stuff is Open Source, we encourage the community to expand upon what we start with. You can find all of our files through the product Github, and do whatever you think will benefit you, or the community at large. Screw down terminals for leads are a life saver. Novice programmers such as myself will have issues getting serial communication to work on Arduino. One thing I did not like on my serial terminal menu was the inordinate amount of time required to hold down + or minus keys attempting to slew the cal factor? How hard would it be to allow typing it in on the text buffer and hitting enter. An excellent product. Works with a 20t load cell. really easy to use, a great start to my new project. Proof of concept was a dream. After calibration, it reads the correct value twice, then drops 1/2 pound (5%). I've calibrated several times and it does this every-time. Seems like there a bug. Sorry you're having problems! 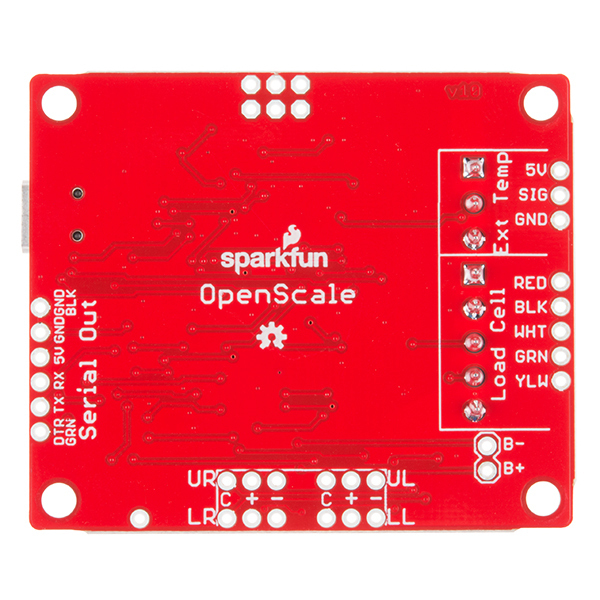 Please reach out to our tech support department at techsupport@sparkfun.com. They should be able to help you with this. It's a great little jump-start. Thanks to @elmer_fud for the heads-up about the over-write of the scale value at startup. Also I found that if you want to use a gain besides x128, you need to edit the HX711 setup call to make it explicit, e.g. "HX711 scale(DAT, CLK, 32); //Setup interface to scale" (and make sure you have the write pinout for the gain you are using). There also seems to be something quirky about the averaging, but I haven't figured it out yet. If I change the averaging from 5 to 10 to 15, there are big offsets for the resulting values ... much bigger than the noise I see in the readings when using the small averaging values. Everything worked great the first time. Connected load cells (scavenged from cheap digital weight scale) directly to board instead of using Combinator. Used Bluetooth Mate Silver for wireless control from PC and Android. Great product! I'm using this for a scale to measure my propane level in my RV. It would be nice if the temperature could be displayed in F without reprogramming. I needed an idiot friendly way of testing a 200 kg, S type load cell. It also needed to be inexpensive. This was both. I do wish that the program for it allowed you to choose grams and ounces but it isn't too big of a limitation either. The 10hz sample speed is fine but I may need something faster for a final product (again, this was purchased to see if my idea was worth pursuing, not for using in the final product). I was able to read out from the load cell in a kitchen scale with it (which I tore into while waiting for the big load cell to arrive). Now that I have the 200 kg cell, I found that I can measure a load as light as a can of soda and as heavy as myself. That's about all I've tested with it, and that's all I needed it to do. Good product, it does exactly what it says it does!